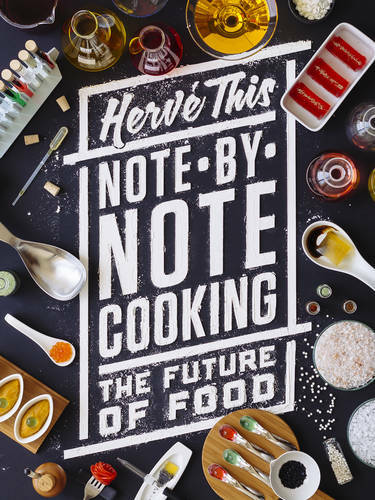 Note-by-Note Cooking is a landmark in the annals of gastronomy, liberating cooks from the constraints of traditional ingredients and methods through the use of pure molecular compounds. 1-Octen-3-ol, which has a scent of wild mushrooms; limonene, a colorless liquid hydrocarbon that has the smell of citrus; sotolon, whose fragrance at high concentrations resembles curry and at low concentrations, maple syrup or sugar; tyrosine, an odorless but flavorful amino acid present in cheese-these and many other substances, some occurring in nature, some synthesized in the laboratory, make it possible to create novel tastes and flavors in the same way that elementary sound waves can be combined to create new sounds. Note-by-note cooking promises to add unadulterated nutritional value to dishes of all kinds, actually improving upon the health benefits of so-called natural foods. Cooking with molecular compounds will be far more energy efficient and environmentally sustainable than traditional techniques of cooking. This new way of thinking about food heralds a phase of culinary evolution on which the long-term survival of a growing human population depends. Herve This clearly explains the properties of naturally occurring and synthesized compounds, dispels a host of misconceptions about the place of chemistry in cooking, and shows why note-by-note cooking is an obvious-and inevitable-extension of his earlier pioneering work in molecular gastronomy. An appendix contains a representative selection of recipes, vividly illustrated in color.